Dr. McEathron often talks to patients about how to slow down age-related vision changes to their vision and eyes. It’s his gentle way of bringing up the inevitable- along with the rest of our body- our eyes change as we age. This blog post is part one of a discussion on how to slow down those birthday induced changes to your eye health and vision. There is much talk about protecting your skin from the sun- wearing sunscreen daily and link between UV exposure and skin cancer- but let’s talk about your eyes. The tissue on and around our eyes is thinner and more sensitive than the rest of our body. Eyes can sunburn with a great amount of sun exposure in a short time. This effect is called photokeratitis and can be very painful. Symptoms can include watery eyes, burning and feeling like grit is in your eyes. Thankfully it is typically short-lived (up to one week) and usually has no long term effects. Long term UV exposure to our eyes can however have long term effects, including on our age-related vision changes. UV-A and UV-B light rays speed up the process of forming a cataract and increases the risk of macular degeneration. Both of these conditions affect your vision – cataracts make the world seem cloudy and blurry- which cannot be corrected with glasses, only surgery. Macular degeneration is a loss of the central vision- a blind spot that is irreversible. As previously mentioned- the skin around the eyes and tissue on the eyes is very thin. Consequently, excessive sun exposure without proper protection can lead to skin cancer and premature signs of aging, therefore furthering age-related vision changes. Sunglasses protect your eyes today and tomorrow! Whenever you spend time outside, there are easy ways to protect your eyes from the sun to help reduce the risks discussed above. Wearing quality sunglasses that provide 100% protection against UV-A and UV-B radiation is the first step. Transition lenses (that darken in sunlight) also provide 100% UV protection. Wrap-around sunglasses provide the most amount of protection. Don’t forget about protecting children and young adults eyes too! They typically spend the most time in the sun. Therefore, implementing the sunglasses habit can make the biggest impact to their long term eye health. It does this by reducing the amount of accumulative hours of UV exposure! In addition to sun protection- yearly eye exams to monitor eye health in all of these risk areas are very important. If you have any questions or concerns- please contact us for an appointment today or stop in to talk with one of our opticians about sunwear! 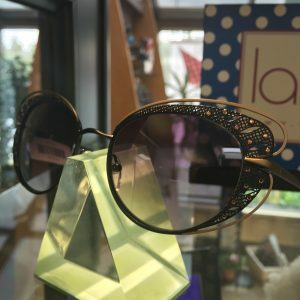 We purposefully choose not to do many “package deals” because we believe your eyes and therefore glasses lenses needs are as unique as you. And, we enjoy discussing the thousands of options available with you to customize a great pair of glasses. However — this summer we’ve partnered with our lab to create an amazing polarized sunglasses lenses package. It combines the best features available in prescription sunglasses. It is also at a great price and still offers some customization options! The sun’s rays reflect light in every direction. When this light hits a flat surface (roads, water surface, windshield of oncoming car), the reflected light shines back at your eyes and is concentrated- causing glare. Glare reduces your depth perception, distorts your vision and color perception. Glare can even temporarily blind you! Polarized sunglasses are designed to absorb horizontal light waves which neutralizes glare. This allows you see to objects more clearly without the shine. 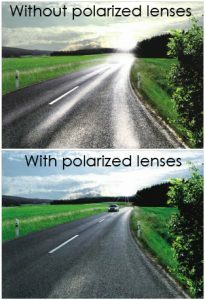 Tinted lenses reduce the amount of light that travels through the lens, but does not have this benefit. All polarized lenses provide 100% protection against harmful UV-B rays that prematurely age your eyes and the skin around your eyes. Not convinced? Let us show you a demo! Especially in Bellingham when the sun shi nes after a rainstorm and we are surrounded by beautiful bodies of water to play on- polarized lenses are life changing. 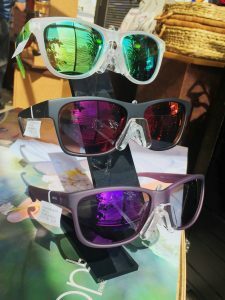 Included in our polarized prescription sunglasses lenses package are top of the line polarized freeform lenses (either single vision or progressive lens designs). These have premium backside anti-reflective coating. Lenses come standard with polycarbonate material, an impact resistant material that is lightweight and durable. All lenses have an eighteen-month warranty including two remakes for any reason. Your satisfaction is our top priority. 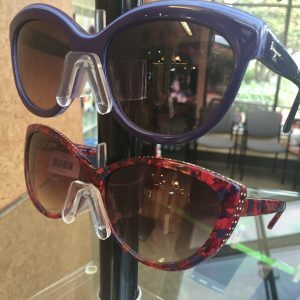 Optional upgrades include mid-index and hi-index plastic, full personalized freeform lenses or mirror coatings (multiple colors available). The package savings are over $150 and are still eligible for our multiple pair discount! 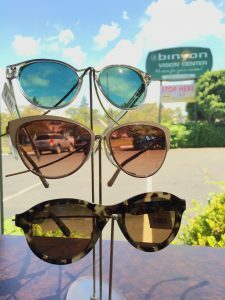 We have a great selection of sunglasses frames and lenses! Please stop in to talk to our obticians and discuss the polarized lenses package! What’s #trending in the 2016 sunglasses style? Clear Frames – classy cool, and more subtle if you’re not into bright colors- paired best with dark grey lenses or colorful mirrored lenses. Round Frames – the retro mainstay is back in a big way echoing the vibes of the 60’s/70’s scene but fresh and one of this season’s must haves. Mirrored Lenses – as seen… everywhere! Silver flash, gold flash, blue, green, red, pink – hiding your eyes behind a playful shiny lens. These are perfect for someone looking to have fun in the sun! Chunky Frames – do you like high impact? Oversized suns get a fresh update with thick, bold lines and layers of color. 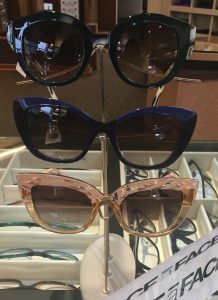 Cateye Frames – a continued shining star in the sunglasses world include new features for 2016 – embellishments, mirrored lenses and ultra exaggerated shape.